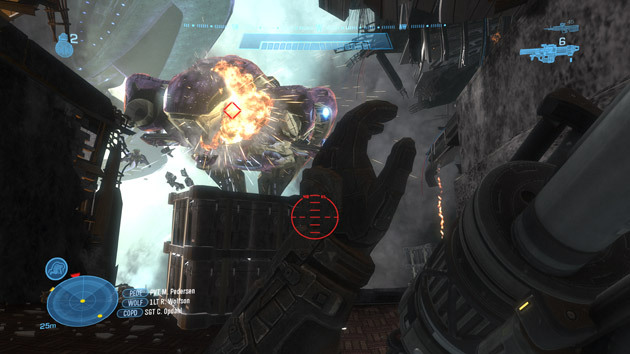 A recent article on whether or not Halo: Reach is good for gaming has sparked something in me. I, too, have a bone to pick with the game, but it’s not with the game, per se. No, it’s a problem with a mechanic in the game that’s also found in other games. I speak, of course, about checkpoints. They are stupid and I wish they would go away forever. Thank you. So as I alluded to in my big Halo: Reach dealie the other day, the game makes use of a sort of dynamic checkpoint system. Usually what happens is that your clear out an area, and then a checkpoint kicks in. Most of the time, fine, whatever. When it works, it works, right? But what about when it doesn’t work? There was a level toward the end of the game—the level with the scorpion tank—that, for whatever reason, didn’t trigger a checkpoint when I absolutely could have used one. I mean, my scorpion tank was engulfed in flames, I, myself, had very little life, and I was to take on two ghosts, those sniper grunts, a couple of turrets, and two wraiths. I eventually cleared the hurdle—I’m fairly certain every single atom in my body aligned in such a way as to give me the strength and dexterity to clear the challenge—but my God in Heaven! Compare that to something like Quake, which I recently played again in light of John Carmack’s keynote at QuakeCon a few weeks ago. There, you simply press F5 (I think it’s F5) and you save your game. What ends up happening is that you save the game at your own pace. You can be the type of person who saves after every downed enemy, you can forego saving altogether, or you can find a happy medium. You work at your own pace. I tend to save fairly frequently, because there’s very few things as frustrating as re-doing a tricky section because you ate a rocket. I’d rather turn the game off then re-load and try again. So why can’t this system be implemented in a game like Halo: Reach? Is it the lack of buttons? I don’t remember the D-Pad being used for much—I think Left turned on the night vision, but what about the other directions? Hm? Tap Down to do an instant save or whatever. Would it “break” the game? A sort of, “Well, if you can save every two seconds there’s no challenge.” Listen, there’s no “challenge” in having to constantly replay a section because you’re left with nearly no health and ammo and are facing Unsurmountable Odds™. My being able to save at my leisure doesn’t “break” the game any more than having to listen to a bunch of forced Soldier Talk. All I’d like to know is, why, in 2010, do we still have to put up with checkpoints? Why don’t we just go back to having “lives” while at it?